Council conflicts: she stated that her goal is to work together and there would no major/minority divisions. It’s not productive to have a divided Council and she looks forward to more 5-0 votes. Newton mentioned that when she first moved to Rockville, it seemed that despite the diverse perspectives and opinions, people got along but now discussions seem to be mean-spirited. She would like things to change so that people know they’ve been heard, but not insulted. Budget: the last worksession and public hearing on next year’s budget will be at the next Council meeting. She had a discussion recently with Hans Reimer about the duplication of government services since Rockville is also the County seat, and perhaps the County would reimburse the City for services. There was mention of the Memorandum of Agreement between Takoma Park and Montgomery County as a potential model, and it was unclear if the planning for the sound wall in the West End could be included in this year’s budget. This also provoked a lively discussion about the opportunity to take on additional debt since interest rates are so low and what would be the appropriate circumstances to assume additional debt. Newton confirmed her fiscally conservative stance and stated her unwillingness to consider debt as a first recourse to solve financial challenges. There was also some discussion about moving to a two-year budget cycle to allow for better planning and Newton would like to have a standing finance commission consisting of experts to advise Council. There was also an interesting discussion about meeting anticipated revenue shortfalls due to the declining property values, including adopting constant yield rates on property taxes, issuing separate property tax bills to distinguish city and county taxes, changing conditions so that the city isn’t blamed for the county’s continuing tax increases, the appropriateness of the $700 per capita debt ceiling set in 1989, promoting Homestead exemptions, and whether HOAs were being double-taxed (whew!). Economic Summit: Newton would like to follow-up on last year’s summit but include other perspectives, not just economic, but she doesn’t know when another summit might be held. She also would like to see a visioning process similar to 1995, but would like it to be more inclusive. Revisiting Decisions: A question from the audience prompted a discussion on the recent decision by Council to change the zoning code to prevent Pumphrey’s from building a parking lot adjacent to their business. Newton felt that non-conforming uses should not be allowed to expand and that this had been a long-standing policy of the City. While some had portrayed the current Council as changing their mind, she stated it was the previous Council that had changed its mind by granting permission after three previous attempts had been denied. All that in an hour! The group then went onto to discuss a stream clean-up in Rose Hills in a couple weeks, plans to hold a forum for civic associations to discuss issues of mutual interest, the upcoming recommendations on the community review process for new developments, and the Celebrate Mom event in Town Square on May 5.
meeting. Obviously it is a closed network. I attended one meeting and never head back from any of the RCC group. May 3 would have been a good day for me to attend since I am very interested in this Charter Review. Thank you Max for posting this information. How does one get information when the RCC meet or is it a closed group? As a member of the board of RCC, I can tell you that it’s a very young organization that’s still in the process of forming so the logistics and responsibilities haven’t been entirely worked out. Since last fall, we’ve determined our mission, legally incorporated, formed the board, and built a website but membership forms and mailing list are still under construction. It’s an all-volunteer effort and nearly everyone has an opinion, so it takes time. 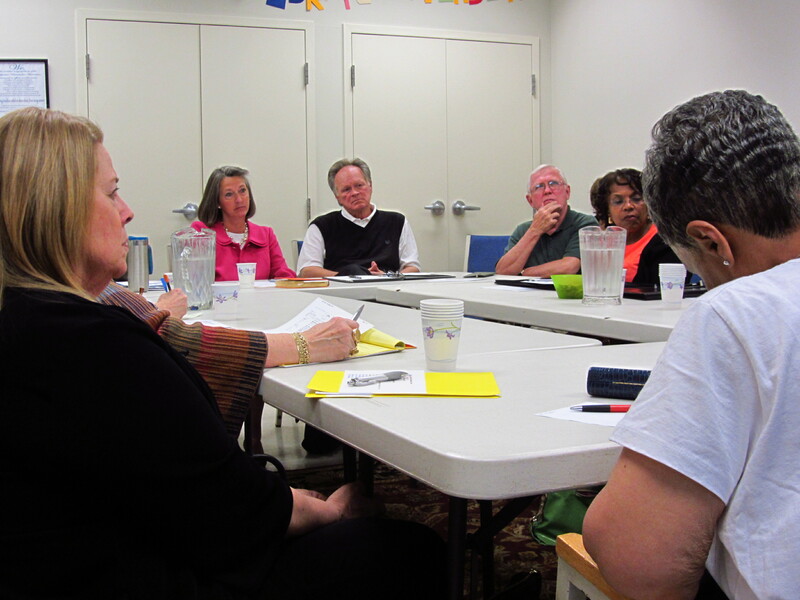 The goal is to serve as a city-wide organization to discuss current issues, explore potential solutions, and identify ways to improve and enhance the community as a whole (which is distinctly different from other community groups that focus either on a neighborhood or around a special topic). Its events, such as the meeting with Councilmember Newtown, are open to the public. We’re trying to keep them informal and small to encourage discussion, however, I will admit that even at this early stage (it’s just a few months old), the events are close to standing-room only. We’re developing a list for those who want to receive announcements but at this point, everything has to be electronic to reduce expenses. For more details, visit the website at rockcom.org for announcements of upcoming meetings and use Contact Us to send a request to be added to the email list. our website should carry our meeting info for Brigitta and other interested folks.